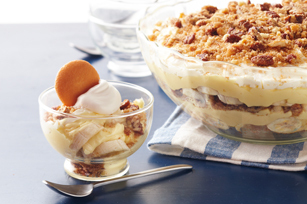 Pecan streusel topping—made with Nilla Wafers— adds buttery crunch to creamy banana pudding. MAKES: 16 servings, 1?2 cup each. 1. Heat oven to 350oF. Crush 30 wafers; mix with next 4 ingredients. Spread onto bottom of 15×10×1-inch pan sprayed with cooking spray. Bake 5 min. ; stir. Bake 3 to 5 min. or until golden brown; cool. 2. Beat pudding mixes and milk with whisk 2 min. (Pudding will be thick.) Stir in 1 cup Cool Whip. Layer 1?3 of the crumb mixture and half each of the bananas and pudding in 2-qt. serving bowl; repeat. 3. Beat cream cheese and granulated sugar in medium bowl with mixer until blended. Gently stir in 1 cup of remaining Cool Whip; spread over top, sealing to edge of bowl. Sprinkle with remaining crumb mixture. Refrigerate 3 hours. Top each serving with remaining Cool Whip and whole wafers just before serving.